Greenhealth is the membership magazine for Practice Greenhealth members. In each issue, we will present the latest topics, ideas and practices being discussed and implemented among the community working to make health care ecologically sound and sustainable. This publication is our primary communications vehicle to keep you informed of the activities Practice Greenhealth is conducting on behalf of members and the health community. Visit Greenhealth magazine online at http://magazine.practicegreenhealth.org. See back print issues below. Greenhealth magazine encourages the submission of articles that bear directly on health care sustainability theory and concerns, and falls in line with the Greenhealth editorial calendar. Our submission guidelines have been carefully prepared to facilitate the editorial process of publishing articles in print and online. Reach more than 4,500 health care professionals representing nearly 1,300 health care facilities and health systems through Greenhealth via print and online. Get started on the right foot in 2017 by advertising in all four issues. 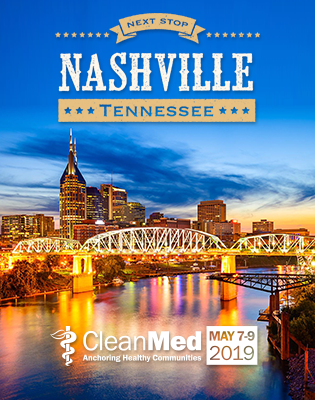 Topics include Environmentally Preferable Purchasing and Waste Reduction, CleanMed 2017, Metrics and Recognition, Sustainability and Health and more. Act soon to reserve a premium spot so you will be noticed. Download the 2017 Greenhealth Media Kit now. Members, please log in to download PDF issues of Greenhealth. See http://magazine.practicegreenhealth.org for online versions of Greenhealth magazine.